I own a lot of AMD stock.... and need advice. Can someone in the 'know' explain if this new chip actually has potential to turn around this horrible company? It sounds impressive on paper, but a lot of the Jargon and spec talk is beyond me. Any input on what this chip might do for the company would be helpful. I'm bearish on AMD overall, because I'm worried that their 15%+ reduction in their marketing teams (from 2013) has caused the situation that they're in right now. It doesn't matter how good the chip is if OEMs aren't gonna build it. IIRC, rumors was that ~10% of engineers were cut (ending the Bulldozer / Piledriver line of Opteron chips), while marketing was closer to 20% to 30%. The marketing fallout since then has clearly been a reduction in OEM offerings from Dell, HP and so forth. Little history lesson: AMD's secret to profits in the 2006 was their Opteron line of server chips that sold for $1000+ a pop (and often two or even four were needed per server) with over 40% server marketshare. Companies like Google would buy them by the boatloads as the web expanded. I think the Opteron brand has a chance for 2016 with Zen for a breakout, maybe back up to 15% to 20% of server marketshare (with much cheaper ARM chips), but I'd hedge any bets on AMD until I was sure that they started making a comeback in that high-margin server market. The high-margin server market subsidizes the R&D for other chips, and thats why Intel (with a strong Xeon server offering) can offer benefits even on the low-end of the market. (the Intel i3 uses much of the same technology as the advanced Xeon). Without the high-margin server market, AMD is fighting with a disadvantage, and will continue to do so until they recapture server marketshare. From a business standpoint, AMD has done an extremely innovative thing with Carrizo however, and it isn't really talked about in that article. Carrizo (Richland/Kaveri-replacement) and Carrizo-L (Temash / Kabini replacement) use the same socket. It means that HP / Dell / other OEMs can make one motherboard design and have it use any Carrizo or Carrizo-L chip. This should provide new flexibility in the marketplace and from a supply-chain perspective moving forward. (It likely means that higher-power like 35W laptops will be infeasible however... maybe?? But 22W laptops and lower are all the rage now-a-days). It also means that AMD has absolutely no short-term CPU desktop strategy unfortunately. AMD's sales teams should have an easier job "selling" those chips to Dell / HP / Asus laptops, at least in the cheaper... lower-margin marketplace. But until I see major design wins, I'd hedge my bets against AMD. Unlike NVidia, AMD only has one new GPU offering in their 300-line of cards. The rest appear to be rebrands right now. This suggests weakness in their engineering teams, possibly related to the cuts from years ago. Nonetheless, winning the Macbook Pro line is a big, so I'll have to admit AMD's GPU business looks relatively solid, and is probably underrated by current reports. Nonetheless, I still consider AMD's GPU business much weaker than before, as I can't find any AMD discrete cards in laptops outside of the Macbook Pro line and a couple of MSI laptops. My American bias tends to ignore AMD's relative success in India and Mexico. Apparently, AMD's cheaper offerings are doing better outside of the US. Nonetheless, the reputation of AMD's brand is pretty low in computing circles in my area. Overall, AMD's branding is very weak compared to Intel. If Carrizo ends up being a hit from a hardware perspective, I doubt it will have any sales figures (in America) until several quarters go by. The standard computer buyer recognizes "i5" and "i7". No one knows what an "A8" or "A10" offers. As a consumer, I'd probably buy Carrizo depending on how the benchmarks come out. But this discussion is a bit different than an "investing" discussion. Also, while the 7970 / R9 280x / R9 370x rebrands (all the same chip) is a bit annoying from a consumer perspective, the card is honestly being offered at such a solid price its hard to not recommend it. Overall, I like AMD's chips because they're at a good discount compared to Intel, and I personally find other components of the laptop more important. (ie: SSD or the screen). So I'll personally continue to buy AMD. I'm personally not going to go short on AMD personally however (or pursuing strong bearish strategies like buying puts). They've cornered the video game market (WiiU, PS4, XBox One), they've cornered the GPUs on the entire Mac-line, they're re-entering ARM and have the best shot at ARM servers. But they're almost at like "startup" levels of risk. If AMD's Zen architecture (2016) and their ARM Opteron (2015) plans don't pan out, they're basically done for as a company. High debt, low cash, high turnover in their leadership positions, fewer product releases and weakening brand. They're in a high-risk situation for sure. Yeah, its hard for me to be bullish on a stock that hasn't made a profit in 3 years (since 2012). But hey, the market has accounted for that. Beta is 2.2, Volatility is roughly 45%, and Options implied volatility is trading around 44%. The market knows AMD is a risky stock that can go anywhere. But I'm a very conservative investor, so I wouldn't touch something this risky. And yet... AMD's Market Cap is 2.39B, which means the market currently thinks that they're half the company of GoPro. (lol, no). AMD's market cap also argues that they're worth 5x less than NVidia (Market cap 12B). So... ehh... at these bargain bin prices, AMD kinda has a fair evaluation by the market. Lets see... AMD's market cap is comparable to AOL (3.14B), Konami Corp (2.86B), Logitech (2.43B), BOX (2.19B), and Zynga (2.06B). I honestly dunno, I feel like AMD is "worth more" than these other companies innately even with all the headwinds against AMD. I dunno, maybe worth half of NVidia at least (NVidia seems fairly evaluated at ~12B against Altera and Xilinx) ? Lol, by that analysis, that pegs the target price of AMD (in my mind) to $6. So that makes me a bull. Lulz. I'm so good at this game I'll have to look through more financial figures (I know AMD is severely in debt right now) to normalize the price. Anyway, I'd be interested in hearing your evaluation of AMD . Really, it all comes down to price, what you think AMD should be worth vs where it is right now. AMD is in a very bad position right now, but they still have technology, patents, and a top-notch engineering team. But its market cap is also absurdly low, so its definitely a cheap stock to buy. Last edited by KnightExemplar on Thu Feb 26, 2015 3:58 pm UTC, edited 1 time in total. The only thing you left out in your detailed analysis of the company, that I am aware of, is the fact they have patents on x86 .... architecture? I'm not an expert, but I have read their patents are very valuable, hence why buy out rumors were kind of squashed (A chinese Company wants to buy them) --- but apparently the patents can't transfer. I'm long on the stock for sure after your post . I got in at $4 a share so I'll just wait it out. I would hope the company got sold before it hit $0. x86 is a complicated mess. Intel technically owns the instruction set, and they've given licenses to the instruction set to AMD (and VIA). I don't think there are any other companies who can make x86 chips. However, AMD invented the 64-bit version of x86, which means Intel pays AMD for the 64-bit features. The details of the cross-license are behind closed doors, but the rumor is that the AMD / Intel licenses won't survive a buyout. So any buyout propositions are unlikely, unless its entirely for AMD's GPU section. Oh, and just so that we're clear. When I say AMD has "won the Mac line", I'm talking about their GPUs, not their CPUs. Macbooks are Intel CPU + AMD GPU. I think my post was a bit ambiguous in this regards. The consoles (PS4 / XBox One) are all AMD CPU + AMD GPU however. I've noted before that AMD's chances to make a comeback definitely rely on its ability to deliver "Zen" to serverspace. Keep an eye on Intel Xeon D. AMD Zen (and the rest of the ARM Microserver market) is going to be going up against Intel Xeon D's successor next year. Integrated 10 GbE ports is a big deal. That feature usually prices servers at a few hundred dollars premium, and now Intel just magically absorbs that premium into its margins. Any news from AMD's Seattle, the one with ARM A57 cores? There was a lot of noise about it last autumn, but I can't find anything new. By now, the A57 is showing up in phones, proabably in much larger volumes than AMD is aiming for. That makes me wonder: suppose AMD succeeds to finally carve out a market for ARM servers. Surely possible. Then, how long before 'traditional' ARM users offer a similar product? Freescale, or Broadcom, even Qualcomm. A myriad other firms design ARM-based Socs that I haven't even heard of. Obviously, Qualcomm shows that you can make huge profits selling ARM cores. But their market power comes from the modems, not the CPU. Does AMD have something to set them apart from the pack in a hypothetical ARM server market? I have a feeling that AMD Seattle is just a proof of concept product for software developers. AMD Seattle as demo'd showing off a Red Hat build... and development boxes were shipped. In any case, the phone market is done. Its Apple, Qualcomm, and maybe Samsung who can succeed there. It would take a major market disruption (or an assload of cash: ie Intel) for someone to break into that market. Well, the ARM server market is almost completely vaporware right now. So it doesn't take much to "set them apart". The following advantages are rather "soft", but they are advantages. * Maybe... HSA. Lets see if AMD can scale-down their GCN architecture. The CPUs in phones are inadequate for servers. Server-CPUs are now shipping with 2x10GbE integrated adapters and a ton of SATA ports to cover I/O. Intel Xeon D, Intel Atom, AMD Zen and Kyoto, Applied Micro X-Gene are the forces here. You can't just take a phone CPU and stick it into a motherboard. You gotta also build that motherboard, and you'll need to twerk the chip to actually use that motherboard effectively. ECC Memory, integrated 10 GbE Adapters, tons of SATA ports. The CPU is just a piece of the puzzle. AMD is one of the few ARM player that seems to have a plan for the motherboard / northbridge. AMD also has connections with Dell, HP, and other OEMs. AMD is also directly sells servers to the market through its SeaMicro purchase (sure... with Intel Chips, but gotta start somewhere...). Although... AMD has to actually have x86 marketshare for their "Zen" plan to actually turn into an advantage. But... I'd still give AMD a chance here. A better chance than everyone else IMO. Applied Micro's relationship with the HP Moonshot project makes me consider them a contender in server space. X-Gene was successfully launched in 2013. Cavium has a relationship with Lenovo. ThunderX did ship IIRC. This may play a role in the early ARM-server market. But in any case, Qualcomm, NVidia, and every other ARM player is years away from delivering even a proof-of-concept solution to serverspace ARMs. When I see news from the phone manufacturers about 10 GbE integrated chips... then I'll start paying attention to them. That's what sets AMD, Cavium, and Applied Micro apart. True server-level features that matter in the datacenter. EDIT: Oh gosh, is March Madness happening again? I didn't mean that phone SoCs should be put in servers... It just shows that plenty of time has passed to incorporate the A57 into a matured design, and out on the market. I am not sure that Ethernet is the bottleneck here. There a lot of specialised chips for networking, based on ARM or Power. Look at this for example: http://cache.freescale.com/files/32bit/doc/fact_sheet/LS2FAMILYFS.pdf, which if I am not mistaken is a chip targeted at cell phone networks. From a layman's perspective, it doesn't look that far off a server, at least for the kind of applicstions that AMD is also targeting, ones with relatively low CPU loads relative to IO. Or this:http://www.cnx-software.com/2015/02/16/hisilicon-d02-armv8-server-board/ HiSilicon is the chip division of Huawei, so I suppose that chip has a similar phone network pedigree as Freescale's. I think I understand your question then. I understand your concern. ARM has grossly simplified the development of chips, so anyone can basically build an ARM server. But, as stated earlier, AMD does have prior experience in the field, and relationships with server OEMs. If building an ARM server is as easy as "buy AMD Motherboard + AMD x86 CPU OR AMD ARM CPU", I think that will play to a lot of datacenters that are on the fence with ARM. They'd be able to switch out ARM server with x86 servers by only swapping out the CPU. Even if datacenters didn't have the technical "expertise" to apply thermal paste on a CPU + pop a fan in place... OEMs benefit by consolidating motherboards / chassis. It won't be very hard for Dell, HP, etc. etc. to support AMD's ARM and x86 strategies simultaneously. All those other companies need to develop a server motherboard. And OEMs may balk at the idea of taking on inventory in the fledgling ARM server market. But betting on AMD's Zen architecture will be a much easier pill to swallow. After all, if AMD's ARM strategy fails, OEMs can just sell off excess FM3 motherboard inventory by selling AMD x86 servers. Zen lets OEMs take much less risk and ease into ARM. The FM3 socket compatibility with AMD's Zen x86 and Zen ARM strategy is a pretty neat advantage... one that only AMD can pull off. Probably not a massive advantage. The Boston Viridis by Calexdia did in fact manage to reach that state where it was selling proof-of-concept servers out (before the company filed for bankruptcy...). 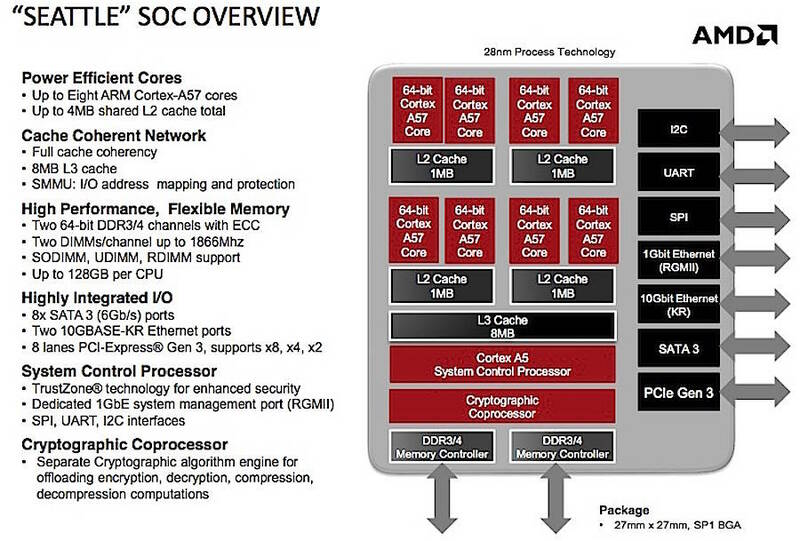 So ARM servers will certainly grow in the coming years... but AMD's x86+ARM strategy makes sense to me. I can't really imagine it wouldn't require a OS update and probably a firmware update for the north bridge. Dunno if current north bridges have such a thing as firmware or that they are in effect ASICs. In the latter case it would require replacing the north bridge. I think pretty much every part of the old north and south bridges will be incorporated in the SoC. KnightExemplar wrote: The FM3 socket compatibility with AMD's Zen x86 and Zen ARM strategy is a pretty neat advantage... one that only AMD can pull off. One other trick that AMD should be capable of pulling off would be adding HBM to FM3. HBM being the memory stacking technology in the soon-to-be released AMD 390x, and hopefully they will have enough experience to be able to ship it in a server machine a year later (very risky, but AMD might not have the choice). The cat/ARM servers AMD has produced seem to have rather pitiful performance, mostly because of the cores themselves (which sacrifice speed for efficiency) but also because the limited number of cores (no more cores than Intel puts Broadwells on consumer models). My guess is that the chips become memory limited (at least limit the efficiency) and that HBM might allow enough cores for competitive servers. Note that following a design by only one year doesn't really seem long enough for a server architecture vs. a graphics card. Such an idea has likely long since been pushed off the table (no matter how long AMD has been selling the idea of HBM for GPUs). AMD has been experimenting with HBM since 2011... maybe earlier. Apparently, only now is the price/performance ratio worth it to use HBM instead of GDDR5. People who use servers don't really care about "fast" RAM, as much as ECC RAM and tons of it. Servers regularly have 192GB+ of RAM, especially if you're moving into virtualization. HBM might be a useful trick for all that HSA stuff AMD is pushing, especially if the CPU and GPU can take advantage of HBM RAM (and if the OS can tell the difference between the two and appropriately allocate the resource across chips). HSA and OpenCL adoption has to grow beyond CUDA for that however. So there's a bit of chicken-and-egg situation here. FreeSync are finally released, and I'm generally seeing positive press about it. I'm unsure if FreeSync will provide any benefits to AMD's stock price, but its definitely gonna cause me to buy a FreeSync monitor. I just am holding up a bit to see the reviews, just in case something horrible comes out in the next month or two with the new technology. AMD already provides the means to connect 128G of ECC to these chips (no idea if 128G draws more power than the chips themselves). My assumption is that these chips would be much more desireable with 4-16 times as many cores. The only real way to do that (and not have all your processes stall on cache misses) would be to add massive amounts of cache, i.e. a few gigs of HBM. As far as AMD stock goes, my general attitude for nearly two decades has been "buy AMD processors, but Intel stock". I'm not nearly as bullish on AMD processors anymore (I think the 83xx still does well vs. i5s and i3s, but haven't followed close enough). I'd take a long, hard look at historical AMD returns (I've often heard they have returned *zero* returns over the long haul) and if you want to speculate on them, consider options (since there is much less hope on the underlying stock being valuable). I'm also less impressed by Intel stocks: Moore's law seems to be dying, thus giving competitors a chance to finally catch up in the process department. I'm not sure Wall Street is going to deal with a change over the last 4+ decades (note that this isn't necessarily good news for AMD. If the ARM horde eats Intel's lunch, AMD's x86 franchise suddenly loses a whole lot of value). My assumption is that these chips would be much more desireable with 4-16 times as many cores. Not necessarily. Some large servers cache massive amounts of database requests to RAM, to reduce disk IO. For those people, more RAM is more performance while CPu loads are fairly low. They would prefer to spend less investment and power on CPU cores, and spend the remainder on more RAM. These kinds of markets seem to be AMDs target: people who need lots of RAM, or Ethernet, or SATA, but relatively little CPU power. With more cores per SoC (like the hisilicon board above), it's a much more direct attack on the large Xeons. Lots of little cores to beat the large cores.It's unclear if ARM cores are ready for that competition. No one will beat Intel at scaling up. First of all, none of the foundries are producing high GHz high-power designs anymore. (Note that even AMD's Carrizo is optimized for low-power). Cell-phone level chip design (low power, low GHz) seems to be what TSMC and GlobalFoundries are offering. Unfortunately, Ahmdal's Law favors larger cores. Not only is programming multithreaded applications harder, but "more cores" doesn't actually scale linearly. AMD was building 8-core Opterons to compete against Intel's 4-core Ivy Bridge. Intel's cores were faster by only about 27% on a core-by-core basis, and yet Intel's chips won in virtually all practical benchmarks. (I'm talking ideal case: running pure integer-code like code compiling and Apache benchmarks. I know the 8-core Opterons only had 4-FPUs). So we can see that core-for-core, the Intel i7 is only 27% faster than the AMD FX-8350. And yet, even on multithreaded tasks like compiling, the Intel i7 won over, due to Ahmdal's Law. So Intel will continue to win practical speed benchmarks. Work done per Watt is the benchmark that ARM servers might beat Intel in, especially in light-tasks like pure static web serving, or MemCacheD / Redis machines (which are purely RAM-limited applications). So I'm gonna place my bets on the smaller, quad-core ARMs that focus on I/O efficiency. Or if anyone builds a truly high-performance ARM core that competes against Intel, they'd also have an advantage. X-Gene ARM offers much much less performance/watt than a Xeon (which has the greatest throughput per watt), while Intel's Atom-based computers have lower absolute power metrics with similar performance. ARM servers (at least the X-Gene) just aren't competing against Intel quite yet. Even if X-Gene offers 50% better performance/watt, they'd still be behind a Xeon, let alone the Xeon-D or Atoms. As far as testing methodology... Frankly, more "real world" tests are similar to Anandtech's "Drupal" test than just straight up file-serving. It looks like ARM may have a chance if it tries to undercut Intel and ARM entirely, and offer an almost pure I/O based solution. (high PCIe count, 10GbE, etc. etc. on as small of a core as possible). Because it is clear to me that ARM is no where close to beating a fat-Xeon in performance/watt, nor is it anywhere close to beating Xeon-D (lower power Xeon), or Intel Atoms either. As a disclaimer, this is very hand-wavy. But... I'm coming up with some different guesstimates for ARM vs x86. And passmark puts the C2750 at about twice the performance of the A4-5000. So, in a very rough/hand-wavy way, the C2750 is roughly 5x faster than a quad core A7. With a Pi 2 (quad core A7) at ~4W, I would think the performance per watt for a Pi 2 would be slightly better than the C2750 (but still worse than the Xeons), and part of the problem with the anandtech bench is only using one relatively power hungry ARM device. Naturally, the more idle time a system sees, the closer an ARM device gets to an intel device. Zamfir wrote: Any news from AMD's Seattle, the one with ARM A57 cores? There was a lot of noise about it last autumn, but I can't find anything new. By now, the A57 is showing up in phones, proabably in much larger volumes than AMD is aiming for. I come in to report that it is time I eat my hat. I was wrong about the A1100 chips being "developer only". A1100 is rumored to be under $171, which is pretty cheap for a server chip (still cheaper than Intel's Atoms). It seems like the A1100 is going to be barely better than a cellphone chip, but with EEC DDR3/DDR4 RAM, 14 SATA connections and 2x10GBe connections, it is going to be an I/O beast. Well... as long as the weak CPU doesn't bottleneck the system. AMD's marketing has been horrible these past years, probably due to cuts. I think that we need to realistically look at AMD announcements as a year or so off target. A1100 will be launching officially sometime this year, which is a very long time away from their original announcement. Nonetheless, there still aren't very many serious ARM chips, so AMD may be late from a marketing perspective... but they're still ahead of the curve IMO. I'm still going to bet that AMD's A1100 is going to be a niche product though. Xeon-D is looking like an awesome chip from Intel. But those who can get away with lower CPU performance but need to support huge amounts of I/O (I'm thinking NAS boxes and the like...), AMD's chip will satisfy that niche well. Rumor is that Facebook and Youtube need chips like what AMD is offering. The question is, if AMD's chips will have good power consumption qualities to be picked up by the major data centers. Wow, another set of blows to AMD's stock price. Skybridge has been canceled. (I guess OEMs don't really care about the motherboard compatibility project.) Big-Carrizo doesn't seem to be anywhere on the market (although Toshiba has begun to ship Carrizo-L), ARM CPU is more or less in the prototyping stage and hasn't really shipped in large quantities yet either. Zen-ARM has been delayed to 2017, Fury X didn't manage to beat GTX 980 Ti. Lots of little losses, lots of failed expectations. I'd be personally interested in AMD Fx-8800P based laptops at 35W... but I literally can't find any right now. Ixtellor wrote: Great feedback Knight. So, I'm up 167% on the stock since I posted that. Thanks for the info I asked about back then. I remember looking at the AMD Stock price and thinking it'd go up at that time... but I didn't actually buy AMD Stock because I wasn't "sure enough". There's certainly still a lot of uncertainty in the next few years for AMD, but Ryzen (formerly called "Zen") looks like its going to be a supurb product. I'm glad it worked out for you though! Eyeballing the yahoo ticker for 3 months, it looks like AMD climbed another 50%. Behold, AMD is Ryezen!